At least two people has died and several people are trapped and injured after a Metro Red Line train derailed and collided with another Metro train, officials say. The six-car train derailed and then collided with another train between the Takoma Park and Fort Totten stations around 5 p.m. Monday. Naturally, the metrorail red line alerts e-mail are euphemistic to the point of being a lie. "Trains are turning back at Rhode Island Ave and Silver Spring stations due to a train experiencing mechanical difficulties outside of Fort Totten station." 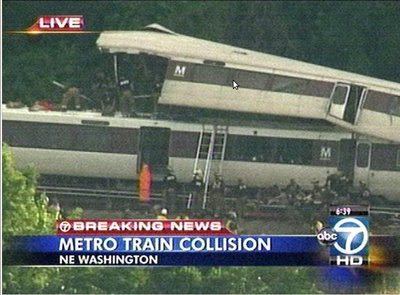 A train derailing then another train hitting it is a bit more than "Mechanical difficulties". Update 6:40pm, added a couple of screen grabs from channel seven. 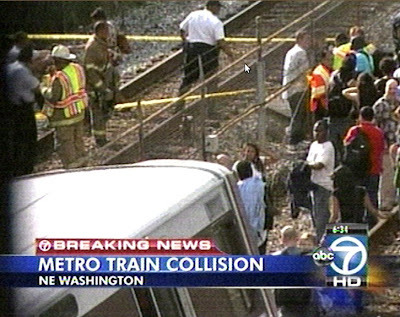 Channel 7 also reports that there are 3 people still on the train, no word on if they are dead, injured, or just trapped.